In two recent articles, “Current Threats to America with AlertsUSA” and “What Would You Do; North Korea Attacks” ,I mentioned the possibility of North Korea launching nukes at America. I also mentioned that my response would involve heading to the basement. A few people shared that they don’t have a basement and wondered what their options are. I decided not only to give some possible options, but also to add some information about different types of nuclear attacks as well as sheltering to protect against radiation and fallout. We’ve been led to believe that if there is a nuke attack, its game over but that’s just not the truth. The truth is that for many who’re outside of the blast zone, with a little forethought and a quick response, many might come through the attack haggard but alive. While I do believe that there is a small chance of North Korea (or anyone else) dropping nukes on the United States, it is still a possibility. If I had a crazy neighbor who hated me, who had a shotgun and said he was going to use it to kill me, I would be foolish to just dismiss his threat. That doesn’t mean we should live in fear. We should just be aware of the threat and have a plan for how to respond when or if the small chance becomes a reality. It’s not just us crazy Prepper’s that are concerned about this. An article from December 2010 called “U.S. Rethinks Strategy for the Unthinkable”, explains that the government is actively taking a look at the subject and trying to educate the citizenry as well. This article doesn’t cover things like radiation sickness, potassium iodide or decontamination. You can find information on these and other related topics linked below. There are three types of nuclear attacks. They are: conventional, Radiological Dispersion Device (RDD) and Electro Magnetic Pulse (EMP). A conventional nuclear explosion can be delivered by an intercontinental ballistic missile or in a small carried device such as the “suitcase nuke”. The area of initial damage is called the blast zone. This is where the greatest damage and loss of life will be. There will be a shock wave that travels near the speed of sound. This will be the second greatest damage and loss of life. If you are in the blast zone or area of the shock wave, you would need to be in a blast rated shelter. The size of these two areas will depend on the yield of the bomb. Those outside of the blast zone and shockwave, depending on distance, may face nuclear fallout and radiation. The commonly held belief is that an EMP will set the United States and possibly parts of Canada and Mexico back to the stone ages. The truth, however, is that we don’t fully know what will happen because nothing of this scale has ever been done. I know that the EMP effect is real. We use a version of it on our planes to shut down surface to air missile stations. What is arguable is how much of the country will be affected. One recent report I have seen says that those within 1,000-1,500 miles of the area over which the detonation took place will have all electronics disabled. I have also read reports that say one EMP would affect half of the country. The other debatable idea is what items will be affected by an EMP. Many people argue that all devices with an electronic circuit board would be rendered inoperable. This would be any vehicle after say the early 1980’s. This would include any vehicle with a computer chip in it. Matthew Stein, author of When Technology Fails and When Disaster Strikes, has said (paraphrasing) that most vehicles that were off should run. They may run rough, but they should run. I have also heard reports that diesels will run after an EMP. One other comment I have is that we wouldn’t be back to the stone ages. They didn’t know what electricity was. We have the knowledge and would just need to repair and replace; granted this could take many years. Here is a very recent article explaining why the threat of an EMP is real, called Chaos from the Sky: Why the EMP Threat Is Real. Thanks to JP for forwarding it to me. The flash that accompanies a nuclear detonation is also very hot. People five to seven miles away can receive first-degree to third-degree burns on exposed skin. If you’re seven miles away from a one megaton explosion, the heat emanating from the fireball will cause a first-degree burn (equivalent to a bad sunburn), to any exposed skin facing the light. If you’re six miles away, it will cause second-degree burns, and if you’re five miles away, the thermal radiation will cause third-degree burns — a much more serious injury that would require prompt medical attention. Paraphrased from the National Terror Alert.com. Fallout is caused by radioactive particles (Alpha radiation) that get sucked up during a nuclear explosion and come back to earth attached to dust and debris. Fallout from a nuclear explosion may be carried by wind currents for hundreds of miles. Radiation cannot be seen or smelled. It can only be detected by radiation detection devices such as a Nuke Alert or a Geiger counter, among others. Those in the fallout area will need to be in a fallout shelter with enough shielding to block the radiation; this is covered more below. As I mentioned above, there have been many misconceptions about the lethality of a nuclear explosion. The information below shows the amount of damage at different distances. This information comes from the National Terror Alert.com. The fission bomb detonated over Hiroshima had an explosive blast equivalent to 12,500 tons of TNT. A 1 megaton hydrogen bomb, hypothetically detonated on the earth’s surface, has about 80 times the blast power of that 1945 explosion. At the center lies a crater 200 feet deep and 1000 feet in diameter. The rim of this crater is 1,000 feet wide and is composed of highly radioactive soil and debris. Nothing recognizable remains within about 3,200 feet (0.6 miles) from the center, except, perhaps, the remains of some buildings’ foundations. At 1.7 miles, only some of the strongest buildings — those made of reinforced, poured concrete — are still standing. Ninety-eight percent of the population in this area are dead. Virtually everything is destroyed between the 12 and 5 psi rings. The walls of typical multi-story buildings, including apartment buildings, have been completely blown out. The bare, structural skeletons of more and more buildings rise above the debris as you approach the 5 psi ring. Single-family residences within this this area have been completely blown away — only their foundations remain. Fifty percent of the population between the 12 and 5 psi rings are dead. Forty percent are injured. Any single-family residences that have not been completely destroyed are heavily damaged. The windows of office buildings have been blown away, as have some of their walls. The contents of these buildings’ upper floors, including the people who were working there, are scattered on the street. A substantial amount of debris clutters the entire area. Five percent of the population between the 5 and 2 psi rings are dead. Forty-five percent are injured. One of the effects of nuclear weapons detonated on or near the earth’s surface is the resulting radioactive fallout. Immediately after the detonation, a great deal of earth and debris, made radioactive by the blast, is carried high into the atmosphere, forming a mushroom cloud. The material drifts downwind and gradually falls back to earth, contaminating thousands of square miles. This page describes the fallout pattern over a seven-day period. Much more than a lethal dose of radiation. Death can occur within hours of exposure. About 10 years will need to pass before levels of radioactivity in this area drop low enough to be considered safe, by U.S. peacetime standards. A lethal dose of radiation. Death occurs from two to fourteen days. Causes extensive internal damage, including harm to nerve cells and the cells that line the digestive tract, and results in a loss of white blood cells. Temporary hair loss is another result. Causes a temporary decrease in white blood cells, although there are no immediate harmful effects. Two to three years will need to pass before radioactivity levels in this area drop low enough to be considered safe, by U.S. peacetime standards. The more time that passes, the more radiation will decay. There are multiple formulas and charts that can be used to determine the level of radiation. One is the 7-10 rule; for every multiple of 7, the radiation has decayed to 1/10th of its strength. This means that 90% of gamma radiation is gone after the first 7 hours; 90% of that remaining 10% is gone after 7×7=49 or two days. (–LINK Radiation Safety In Shelters–) is a good resource. Most of us can’t afford a ready-made fallout or blast shelter. Even if we could, it’s not very practical. Don’t get me wrong, I would love one and would turn it into Chris’ man cave. (That’s what HE thinks. <wink> -Trudee) Since we don’t have a shelter to go to, knowing how to build an expedient shelter is a good skill to have and pray you never have to use. A basement is ideal, but as was expressed last week, many American’s don’t have a basement. Don’t fret! I have a solution! The reason a basement is ideal is that there is earth on four walls. If you don’t have a basement, you need to add mass either inside or outside the walls. The interior of the walls, to me, seems preferable. This way you don’t have to worry about the elements or anything else destroying it. In my example last week, I said I would take those 13 gallon bins and fill them with earth, placing them on the floor of the area above the basement, piled three feet high. If I didn’t have a basement, one option would be to fill those same bins six or so feet high, by three feet thick, on interior walls. If you lined the four interior walls of a room in your house, you now have a much smaller room than what you started with. As you can see in my diagram below, you can place your bins on the outside walls of shared rooms, this will let you keep your shelter a comfortable size. If you have brick walls or a brick fireplace these would add additional shielding. It doesn’t have to be just earth. 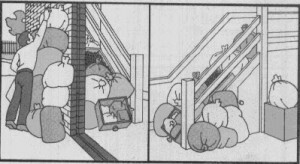 Here are some pictures from some old Civil Defense manuals. Anything that adds mass can be used for shielding. Just remember; the denser it is, the better shielding it will make. In many of the Civil Defense documents from the 1950’s and 1960’s, people are shown adding ceilings to their basement shelters with bricks. 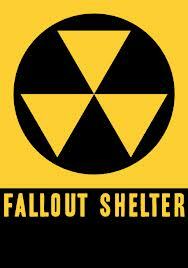 If you’re building your expedient shelter in an interior room you will already have a roof to keep fallout off you. If you have the ability to add more shielding, it can only help. In the image I diagramed for placement of your earth filled bins, you’ll notice how the entrance overlaps. This can also be seen in the image below. Since radiation travels in a straight line and won’t draft in like smoke might, the overlapping shielding is enough to stop it from entering the room. This gets much more complicated but is not impossible. I used to work just minutes away from Minneapolis in one direction, and the Mall of America in another. Both are considered terrorist targets. I worked in a decent sized office building and game planned this scenario. Not only are you faced with finding adequate shelter, but food, water and other supplies. In this image from the Department of Homeland Security, you can see by the higher numbers where the best shelter can be found in various buildings. If you’re caught away from home and don’t see a building that would provide adequate shelter, another possible solution is to shelter under your car. I’m not crazy about this idea and would only use it if there were no other options. In order to be able to do this, you would need adequate supplies to make the shelter as well as to live in it for a time. What if Your Home Won’t Provide Enough Shelter? If you live in an area where you wouldn’t be able to dig enough earth to fill bins to make a shelter, it might be a good idea to be on the lookout for places near your home that might offer adequate shelter. How Long Should I Stay Sheltered? Depending on how close you are to the blast zone, it may take several weeks for the radiation to decay to a point that it is safe to leave the shelter. If the government is able, they will advertise that the levels are safe enough to leave the shelter. A rule of thumb used is that after two weeks of sheltering you can leave the shelter for a limited time and continue to sleep in it. 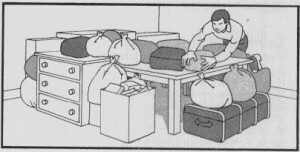 You will need to take precautions to protect against coming into contact with fallout and you’ll need to decontaminate before going back into the shelter. You can find information on that listed below. This is absolutely true! These plants require constant cooling of the reactors. If something happened to shut the grid down, they have backup generators and enough diesel to run for two weeks. If power has not been restored after that and the diesel hasn’t been resupplied, we would be faced with 65 chernobyls or Fukushimas. If you live near a nuclear power plant, this is something to take into consideration. Have a bug out plan! In this scenario, sheltering in place is not a good idea. The radiation is not going to decay anywhere close to the speed that it will from fallout. The best thing to do would be to get a good distance away. Next PostTurn your pile of garbage and dead leafs into pure energy!